I urge all to read a piece by Jim Crawford that lays all of this out. Nine-year-old Bianca Herlory can strike up a conversation in French, Portuguese, Spanish or English, and recently expressed an interest in learning Mandarin. "It's a gymnastic of the mind," said her mom, Stephanie Herlory, who introduced her daughter to foreign languages at a young age. "Once they're immersed, it comes very quickly." As demands increase for a global work force, a growing number of South Florida parents are taking steps to make sure their children learn a second language. Many moms and dads have declared their homes "No English" zones. Some opt to send their kids to language immersion schools. Bilingual parents are not the only ones driving the trend. Parents who speak only English are getting in on it as well. John Melnick, of Pompano Beach, enrolled his sons, Daniel, 6, and Jonny, 4, in the Lycée Franco-Américain in Cooper City, a private, K-8 school that teaches all classes in French. His wife had done research on the school and liked the French system. "I thought at first that there would be serious disadvantages to putting my children into a school where they speak in another language," Melnick said. "I'm getting quite an education." Melnick is learning phrases by watching some of the French shows with his sons. His wife, who doesn't speak much French, often helps the children with their homework. Experts agree that it's easier to introduce children to a second language when they're toddlers because their brains are able to pick up different phonetic sounds faster. It's a misconception to think that introducing children to multiple languages at a young age will delay their language development, said Mileidis Gort, an expert in bilingual education at the University of Miami.But raising a bilingual child is not easy in a country where English is dominant. Kim Thomasson, the dual language specialist for the Palm Beach County School District , formed a support group with neighbors who speak Spanish after she enrolled her son, now 10, in a Spanish immersion program at his public school, New Horizons Elementary. "I knew that unless we spoke exclusively in Spanish and compensated for the overwhelming English in their lives, it would be difficult," said Barry Silver, of Boca Raton, who makes it a point to speak to his sons Ari, 6, and Brandon, 3, in Spanish only. There are hurdles. Parenting in one language can be difficult enough. As children advance in language programs, their skills sometimes surpass their parents'. Some Palm Beach County public schools with dual language programs have parent support groups. The teachers send homework instructions in both English and the foreign language so the moms and dads can help if need be. The challenges haven't reduced interest. North Grade Elementary School in Lake Worth has offered a dual language program for 10 years. In that time, the number of kindergarten classes participating in the program has grown from two to six, said Diana Perez, the school's dual language coordinator. Palm Beach County offers language immersion programs at 22 schools. Broward County offers similar programs at three schools. At the Lycée in Cooper City, Principal Jacquelyne Hoy said the private school is becoming more popular among parents who don't speak French. The local interest mirrors what experts say is happening on a national level. The Center for Applied Linguistics is getting more calls about foreign language preschool, according to staffers who track it informally. "We've definitely seen a surge," said Nancy Rhodes, director of foreign language education at the center. "This is the 21st century. We're living in a global society. We have got to learn languages if we want to negotiate with other countries and get along." Now that well-heeled parents are making another language a priority for their kids, some say they hope it will encourage more Americans to appreciate bilingual skills. "Bilingualism has always been a phenomenon of immigrants," said Gort. "Until we get over the notion that English is the only language worth learning, we're not over the hump." Asta Oskarsdottir of Sunrise, who moved here about a year ago from Iceland, said she continues to speak to her 4-year-old son, Oskar, in Icelandic. "I know how important it is to know your roots," she said. Oskar is also learning Spanish and speaks English pretty well, she said. Marie Ramirez of Weston was losing her Spanish until she decided to speak it and teach it to her 5-year-old daughter, Laura. Ramirez was born here, but her mother, who was born in Cuba, spoke to her in Spanish and French Creole, she said. Ramirez didn't speak much Spanish to her three older children, and as a result they didn't pick it up. When she married her second husband, Alan, who is from Guatemala, she decided to make speaking in Spanish a priority. "My daughter speaks better Spanish than I do," Ramirez said. When her daughter responds in English, Ramirez's automatic response these days is, "Dígame en Español": "Tell me in Spanish." Georgia East can be reached at geast@sun-sentinel.com or 954-356-4629. This is a very important debate. I side on decreasing the statistical chances that kids will fail according to our present conventional grading scheme. I also fall on the side of something not mentioned in this piece, nor perhaps in this specific debate: We should concern our selves more with evaluation than with grading. Grading is part of something much larger that involves evaluation, meaning providing youth with evaluative feedback—even without necessarily having to grade them as such. GREAT DEBATE: Is 'minimum-F' grading an unfair penalty or unfair boost? "It's a classic mathematical dilemma: that the students have a six times greater chance of getting an F," says Douglas Reeves, founder of The Leadership and Learning Center, a Colorado-based educational think tank who has written on the topic. "The statistical tweak of saying the F is now 50 instead of zero is a tiny part of how we can have better grading practices to encourage student performance." But opponents say the larger gap between D and F exists because passing requires a minimum competency of understanding at least 60% of the material. Handing out more credit than a student has earned is grade inflation, says Ed Fields, founder of HotChalk.com, a site for teachers and parents: "I certainly don't want to teach my children that no effort is going to get them half the way there." • In Hillsboro, Ore., the school district is planning to roll out such a policy slowly. School board member Hugh O'Donnell says he hopes it is implemented within a couple of years "once we educate the teachers." • The Dallas Independent School District has a policy not to allow semester grades below a 50. One principal's decision to disallow grades below a 70 in certain instances drew protests this spring and was rescinded. • At Lehn Middle School in Port Byron, N.Y., the teachers turn in numerical averages from zero to 100 for report cards, and a computer program rounds up anything below a 50, following principal Sally Feinberg's policy. "An F is an F, and 50 is still not passing," Feinberg says. "The point is motivation and to give kids the opportunity to pass a grade." A top proponent of a minimum-50 policy, Thomas Guskey of Georgetown College in Kentucky, acknowledges that there are no studies he knows of that examine whether such approaches increase passing rates. "Oftentimes, when schools go to this policy, a major component of doing so is a significant parent training program," Guskey says. "That makes it hard to tell if it's anything the school did, or maybe by informing parents, they become more conscientious." The Texas Education Agency has just released results from the 2008 . The agency reports that 29 percent of Texas 11th graders this year failed at least some portion of the Texas Assessment of Knowledge and Skills, a must-past test for graduation. Students who failed either the reading, math, science or social studies sections will have four more opportunities to pass between now and the end of their senior year. The following is the release from TEA: "2008 TAKS scores show steady progress at most grades"
grade students met state promotion requirements with 95 percent passing the Texas Assessment of Knowledge and Skills (TAKS) reading exam and 75 percent passing the mathematics test. This is the first year that eighth-grade students must pass the math and reading TAKS to be promoted to ninth grade. But this represents the third time this group of students have been required to meet promotion requirements that are part of the state’s Student Success Initiative. They were required to pass the third-grade reading exam and the fifth-grade reading and mathematics TAKS tests in order to move to the next grade. and should raise the cumulative passing percentage on that test above the current 75 percent before the school year’s end. The reading results reported are cumulative totals for the first and second administration. exceed them. A high percentage of the students have passed the reading test and we expect the math passing rate to rise substantially when results from the second test administration are reported, if past trends are any guide,” said Commissioner of Education Robert Scott. One more testing opportunity exists for those students who are still trying to master the exams. The eighth-grade math test will be given again on July 1 and the reading exam will be given on July 2. Additionally, 90 percent of the eighth-grade class passed the social studies TAKS while 68 percent passed the science TAKS. These figures includes results from both the standard TAKS and TAKS (Accommodated), which is a form of TAKS for students served by special education who meet the eligibility requirements for certain specific accommodations. education on material at the grade level in which they are enrolled. Test results reported today include both TAKS and TAKS (Accommodated) results. TAKS results reported in 2003-2007 are for TAKS only because TAKS (Accommodated) was not a testing option until 2008. Ninety-three percent of third-grade students have passed the reading TAKS on their first or second try. This is the exam, available in English or Spanish, that they must pass to meet the state’s promotion requirements. mathematics test in English passed on the first administration. Seventy-seven percent of the 26,769 students who took the math test in Spanish passed it. Fifth-grade students must pass both the reading and math exams in order to be promoted. During the first or second test administration, 90 percent passed the reading exam in English or Spanish. During the first administration of the mathematics TAKS given in English, 83 percent of the students passed. Among the 5,233 students who took the math test in Spanish, 48 percent passed. Any third or fifth-grade student who has not yet passed the reading test may retake it July 2. Any fifth-grade student who has not passed the mathematics test may retake it July 1.
and 8 is retained, unless his or her family appeals the retention to a Grade Placement Committee made up of the principal, teacher and parent. Parents should contact their local school to begin the appeal process. 81 percent mastered. Thirty-seven percent performed so well on the test that they earned a Commended Performance notation. Among the students tested in Spanish, 35 percent passed the science exam. TAKS (Accommodated), scores appeared very stable with 84 percent of the students passing the reading test in both 2007 and 2008 and 86 percent passing the mathematics test both years. Passing rates on the writing test rose to 93 percent, compared to 91 percent last year. percent for mathematics and 90 percent for writing. When just TAKS scores in Spanish are examined, the passing rates this year were within two points or less of last year’s passing rates. the math test rose from 79 percent to 83 percent. There was a one percentage point increase on the reading exam on the standard test. passing and 33 percent receiving Commended Performance. Eighty-four percent of the students passed the reading test and 76 percent passed the mathematics exam. percentage points on TAKS reading and by 3 percentage points on the math test as compared to last year, while passing rates declined by one percentage point on the writing examination. Eighty-four percent of high school freshmen mastered the reading test but just 60 percent passed the math test. When 2007 and 2008 results for TAKS only are compared, results on the reading test increased from 86 percent to 87 percent, while the mathematics passing rates rose from 60 percent to 63 percent. mathematics, 88 percent in social studies and 64 percent in science. A greater percent of students - 32 percent - achieved Commended Performance on the social studies test than on the other three subject-area tests. improvement. The passing rates on English language arts rose from 84 percent in 2007 to 89 percent this year. Math passing rates increased from 63 percent to 65 percent. Social studies passing rates improved from 86 percent last year to 90 percent in 2008, while science passing rates went from 58 percent last year to 66 percent this spring. Texas students must pass four exit-level tests, which are first given in 11th grade, along with their classes, to be eligible to earn a state diploma. The Class of 2009 is well on its way to meeting its testing requirements. met the standard on the social studies examination. Eighty percent of the students passed the science test and 79 percent passed the mathematics test. test, this year’s 11th grade students had passing rates that were one to five percentage points higher on the four tests than did last year’s high school juniors. of our students. I’m thankful for all the effort the students, their teachers, administrators and parents have put into making this a successful and productive year,” Scott said. The Texas Education Agency does not yet have results for school districts or campuses. This article investigates an important factor in student achievement—parental involvement. Using data from the National Education Longitudinal Study (NELS), we estimate a value-added education production function that includes parental effort as an input. Parental effort equations are also estimated as a function of child, parent, household, and school characteristics. Our results suggest that parental effort has a strong positive effect on achievement that is large relative to the effect of school resources and is not captured by family background variables. Parents appear to reduce their effort in response to increased school resources, suggesting potential "crowding out" of school resources. Rio Grande Valley school leaders do not know how new state guidelines for teaching English will affect students. Some districts say the new standards better prepare students for college. Others say the updates could hurt students learning the language. School district officials have not seen the new standards adopted by the Texas Board of Education last week, but many expect they will have to make some changes to their teaching plans - but they just don't know what changes, yet. Some districts remain worried that the updated standards ignore the needs of English language learners and hinder teachers' creativity with their lessons. Teachers would have to follow a more scripted curriculum, which could include more drilling on grammar and phonics, said Maritza Park, the Donna school district's director for elementary English language arts curriculum. ``It's like we went back 20 years,'' Park said. After months of arguing and debating different proposals for updated English language arts standards, the approved standards were given to state education board members just hours before they were to vote on the updates. Several board members were outraged they were not given enough time to review the latest proposal, especially after board members were asked to consider at least five different ones since January, according to the Associated Press. The new standards place a stronger emphasis on grammar and offer grade-specific objectives, said Debbie Graves Ratcliffe, spokeswoman for the Texas Education Agency. ``I think the standards as a skeleton and the districts have to come up with the curriculum guide. The standards provide the basic bone structure but there is still a lot of flexibility that districts have,'' Ratcliffe said. The approved updates should be available to the public in a few weeks, as the agency is finalizing the specific wording of the rules based on the board's wishes, she said. Edinburg's school district is ready for the new standards, said Maria Luisa Guerra, the district's assistant superintendent for instruction and support services. The district began using a curriculum called CSCOPE this year that helps better align lessons from kindergarten though 12th grade, Guerra said. It also is using another program that provides students learning English with more tutoring and monitoring, she said. The updated standards take effect in the 2009-2010 school year. Important to remember that MA, similar to TX, is a state that requires high school exit exams in ELA and Math to receive a diploma, and in theory suggests college readiness. MALDEN - The state's public high schools have received the first-ever reports detailing the performance of graduates attending a Massachusetts public college or university. Individual "School-to-College" reports for 297 high schools were distributed last week, providing details on how graduates from the class of 2005 fared in college, whether they needed remediation when they got there and whether they re-enrolled for a second year. The report contains information on students who graduated from a Massachusetts public high school in spring 2005 and enrolled in a Massachusetts public postsecondary institution in fall 2005. Students who chose to enter the military, not enroll in college, attend college out of state, or attend a private institution in Massachusetts are not represented. "These reports will be critical as we move toward our goal of better aligning the work of our secondary schools with that of our colleges," said Paul Reville, chairman of the Board of Elementary and Secondary Education and Secretary of Education designate. "This information should prompt our secondary schools to re-evaluate whether they are properly preparing their graduates for college." Acting Education Commissioner Jeffrey Nellhaus agreed. "This is data we've never had before, and will be vitally important as we move into this next phase of Education Reform," he said. "Our graduates should enter college well prepared, not in need of remedial help. These local reports will give our schools the information they need to make sure this trend does not continue." "Now more than ever, postsecondary education and training is a necessity in today's new economy. Even entry-level positions demand ever-increasing levels of skill and knowledge," said Patricia F. Plummer, Commissioner of the Department of Higher Education. "The School-to-College project will help educators and policy makers develop sound policies and practices for increased college readiness for all students." Data for the School-to-College reports was drawn from a new database that links public K–12 and higher education data, and is a joint initiative of the Department of Elementary and Secondary Education and the Department of Higher Education. According to the statewide School-to-College report, which was released in February, more than 19,000 students (33 percent) of the class of 2005 chose to enroll in a state public postsecondary institution in fall 2005, comprising the fall 2005 School-to-College cohort. Of these students, 45 percent enrolled at a community college, 25 percent enrolled at a state college, and 30 percent enrolled at one of the University of Massachusetts campuses. * Among public high school graduates in the class of 2005 who attended a public college or university in Massachusetts, 37 percent enrolled in at least one developmental (remedial) course in their first semester in college. * Of students enrolled at community colleges, 65 percent of students enrolled in a community college took at least one developmental course, as did 22 percent of students at state colleges and 8 percent of students at state university campuses. * Fifty percent of students who scored in needs improvement on the Grade 10 Math MCAS exam enrolled in developmental math in college. * More than 80 percent of first-time, full-time degree seeking students reenrolled for a second year of college in fall 2006. The class of 2006 reports will be released later this year. Future reports will be released each spring, approximately two years after each cohort's high school graduation. AUSTIN — The Texas Education Agency is opening the back door to school vouchers with a plan to use state money to help both public and private groups educate dropouts, critics charged Tuesday. Texas lawmakers set aside about $50 million last year for a more aggressive response to school dropouts, which experts say has reached the crisis level in Texas. An estimated one-third of high school freshmen in Texas do not graduate. The resulting High School Completion and Success Initiative Council advocates multiple approaches to address the dropout problem, including "alternative delivery systems," which some believe is code for school vouchers. Universities, school districts and private organizations could compete for funds to return dropouts to school. Texas Education Commissioner Robert Scott chairs the council. Critics complain it is an effort to create the state's first publicly funded private school voucher program. Vouchers allow parents to send children to private and religious schools with tax money paying at least a portion of the tuition. Attempts to pass such a program have failed repeatedly in the Texas Legislature. Scott denied the voucher claim. "The Dropout Recovery Pilot Program is not a voucher program. It is an effort to bring dropouts back into the schoolhouse," Scott said. "It uses state grant funds. It does not divert a penny of Foundation School Fund money from school districts. In fact, school districts are eligible to apply for this grant, as are universities, charter schools, county departments of education, regional education service centers and nonprofit organizations." The Legislature has repeatedly made it clear that tax dollars should be used to fund public schools, not private schools, said Kathy Miller, president of the Texas Freedom Network, which advocates for public education, religious freedom and individual liberties. "Even worse, this program's loose rules would make it relatively easy for parents to simply withdraw their children from public schools and have them identified as 'dropouts' so that the state pays for their private school tuition," Miller said. "That was clearly not the intent of lawmakers last year who sought innovative ways to help public schools reduce dropouts." The Texas State Teachers Association also opposes the idea. Earlier this spring, Scott indicated that using tax dollars to send dropouts to private schools would be appropriate as "some kind of second chance." Scott also noted the plan would not give money for parents "to shop around" like under a traditional voucher program. "I respectfully disagree with the positions taken by the Texas State Teachers Association and the Texas Freedom Network," Scott said. "I had hoped they would join me in making every effort to bring dropouts back to school." * Education service center (ESC) regions with traditionally high attrition rates include: ESC Region 1 (Edinburg), ESC Region 4 (Houston), ESC Region 10 (Richardson), ESC Region 13 (Austin), ESC Region 19 (El Paso), and ESC Region 20 (San Antonio). * The total number of students lost from public high school public enrollment has increased from 86,272 in 1985-86 to 134,646 in 2006-07. At a table of ninth and tenth graders, one boy, whose family had recently emigrated from China, appealed to his seatmates to clarify the question. “Was your country ever invaded,” explained a girl from Pakistan. He then called out, in Chinese, to several other Chinese boys, who suggested—in English—another possible invader: Mongolia. And so it goes at Flushing International and its sister schools (eight in New York City and one in Oakland, California). Language is seen both as a tool of communication and as a way to draw on other strengths of the school’s largely immigrant student population. The number of U.S. students classified as English language learners (ELLs) has at least doubled over the past 25 years, and now accounts for more than 10 percent of total public school enrollment. Collectively ELLs speak more than 460 languages, with the most common being Spanish, Vietnamese, Hmong, Korean, Arabic, Haitian Creole and Cantonese. The U.S. has 10,000 young native speakers of Urdu alone. Overall, ELLs are enrolling in American public schools at a rate seven times the national average for all students. Yet according to data from the National Assessment of Educational Progress (NAEP), only 4 percent of these “English language learners” in the eighth grade are proficient in reading and only 6 percent in math. Seventy-one percent of ELLs scored below “basic” on the eighth grade NAEP reading and math tests. ELLs trail English-proficient students by 39 points in reading and 36 points in math on a 500-point scale nationally. And a survey in 2003 revealed that 50 percent of ELLs fail their graduation tests, compared with 24 percent of English-proficient students. To TC faculty members Ofelia García and Jo Anne Kleifgen and doctoral student Lorraine Falchi, authors of the Equity Matters research review “From English Language Learners to Emergent Bilinguals,” those failures stem from a fundamentally close-minded approach to language—and one that is very much at odds with mainstream thinking in other countries. In fact, while it may seem counter-intuitive, research has shown that using a child’s first language is the most effective way to help her achieve a higher level in an English language school system. 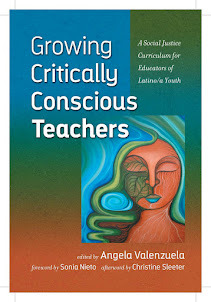 “The benefits of such practices are explained by the concept of linguistic interdependence—the notion that two languages bolster each other and the student’s ability to acquire knowledge,” the TC authors write. That’s very much the thinking—and practice—at the Twenty-First Century Academy for Community Leadership, a predominantly Hispanic pre-k–8 school located in Washington Heights. Beginning in kindergarten, where Margaret Blachley also uses sign language to help kids remember words, classes are taught in English one day, Spanish the next. To Ofelia García—a native Spaniard who, despite her multiple degrees and her flawless English, says she still sometimes feels intimidated walking into American schools—this is merely common-sense thinking. It wasn’t always that way. In the 1960s, the Bilingual Education Act established a federal goal of assisting limited English speaking students in the quick acquisition of English. In the early 1970s, in Lau v. Nichols, a group of Chinese-American parents brought a judicial case against the San Francisco school board that eventually went before the U.S. Supreme Court, successfully arguing that, by being thrown into English-only classrooms, ELLs were being (in the words of the Court’s majority opinion) “effectively foreclosed from any meaningful education.” The Court instructed school districts to take “affirmative steps” to address these inequities, but left the mode of instruction up to the educators. Things began to change in the 1980s, when the focus of the Bilingual Education Act began to shift toward supporting programs that used only English in educating ELLs and that imposed time limits on participation in transitional bilingual education. In the 1990s, the use of children’s native language to support learning came under political siege, perhaps best typified by Proposition 227, a California initiative that prohibits the use of native language instruction and mandates the use of sheltered English immersion programs, where students are mainstreamed into regular classrooms after just one year. And under the federal No Child Left Behind Act (NCLB), passed in 2002, the pressure to bring all students to reading and math proficiency by 2014 has led districts in many states to minimize the number of ELLs per grade in order to avoid having to report data on these students and sustain penalties if they haven’t made sufficient average yearly progress. At Flushing International High School, Kevin Hesseltine agrees. Earlier in the day, his students, asked to split into groups with different flags and divide up the classroom under their respective banners, spontaneously propose a diplomatic conference. Immigration officials lined up illegal immigrants on Thursday at the National Cattle Congress grounds in Waterloo, Iowa. WATERLOO, Iowa — In temporary courtrooms at a fairgrounds here, 270 illegal immigrants were sentenced this week to five months in prison for working at a meatpacking plant with false documents. The convicted immigrants were among 389 workers detained at the Agriprocessors Inc. plant in nearby Postville in a raid that federal officials called the largest criminal enforcement operation ever carried out by immigration authorities at a workplace. The illegal immigrants, most from Guatemala, filed into the courtrooms in groups of 10, their hands and feet shackled. One by one, they entered guilty pleas through a Spanish interpreter, admitting they had taken jobs using fraudulent Social Security cards or immigration documents. Moments later, they moved to another courtroom for sentencing. The pleas were part of a deal worked out with prosecutors to avoid even more serious charges. Most immigrants agreed to immediate deportation after they serve five months in prison. The hearings took place on the grounds of the National Cattle Congress in Waterloo, in mobile trailers and in a dance hall modified with black curtains, beginning at 8 a.m. and continuing several nights until 10. On Wednesday alone, 94 immigrants pleaded guilty and were sentenced, the most sentences in a single day in this northern Iowa district, according to Robert L. Phelps, the clerk of court. The large number of criminal cases was remarkable because immigration violations generally fall under civil statutes. Until now, relatively few immigrants caught in raids have been charged with federal crimes like identity theft or document fraud. Defense lawyers, who were appointed by the court, said most of the immigrants were ready to accept the plea deals because of the hard bargain driven by the prosecutors. If the immigrants did not plead guilty, Mr. Dummermuth said he would try them on felony identity theft charges that carry a mandatory two-year minimum jail sentence. In many cases, court documents show, the immigrants were working under real Social Security numbers or immigration visas, known as green cards, that belonged to other people. All but a handful of the workers here had no criminal record, court documents showed. No charges have been brought against managers or owners at Agriprocessors, but there were indications that prosecutors were also preparing a case against the company. In pleading guilty, immigrants had to agree to cooperate with any investigation. Chaim Abrahams, a representative of Agriprocessors, said in a statement that he could not comment about specific accusations but that the company was cooperating with the government. Aaron Rubashkin, the owner of Agriprocessors, announced Friday that he had begun a search to replace his son Sholom as the chief executive of the company. Agriprocessors is the country’s largest producer of kosher meat, sold under brands like Aaron’s Best. The plant is in Postville, a farmland town about 70 miles northeast of Waterloo. Normally it employs about 800 workers, and in recent years the majority of them have come from rural Guatemala. Since 2004, the plant has faced repeated sanctions for environmental and worker safety violations. It was the focus of a 2006 exposé in The Jewish Daily Forward and a commission of inquiry that year by Conservative Jewish leaders. In Postville, workers from the plant, still feeling aftershocks from the raid, said conditions there were often harsh. In interviews, they said they were often required to work overtime and night shifts, sometimes up to 14 hours a day, but were not consistently paid for the overtime. “We knew what time we would start work but we did not know what time we would finish,” said Élida, 29, a Guatemalan who was arrested in the raid and then released to care for her two children. She asked that her last name not be published because she is in this country illegally. The workers said that supervisors and managers were well aware that the immigrants were working under false documents. Defense lawyers, who each agreed to represent as many as 30 immigrants, said they were satisfied that they had sufficient time to question them and prepare their cases. But some lawyers said they were troubled by the severity of the charges. At one sentencing hearing, David Nadler, a defense lawyer, said he was “honored to represent such good and brave people,” saying the immigrants’ only purpose had been to provide for their families in Guatemala. “I want the court to know that these people are the kings of family values,” Mr. Nadler said. After the hearing, Mr. Nadler said the plea agreements were the best deal available for his clients. But he was dismayed that prosecutors had denied them probation and insisted the immigrants serve prison time and agree to a rarely used judicial order for immediate deportation upon their release, signing away their rights to go to immigration court. Christopher Clausen, a lawyer who represented 21 Guatemalans, said he was certain they all understood their options and rights. Mainly they wanted to get home to Guatemala as quickly as possible, he said. Robert Rigg, a Drake University law professor who is president of the Iowa Association of Criminal Defense Lawyers, said his group was not consulted when prosecutors and court officials began to make plans, starting in December, for the mass proceedings. “You really are force feeding the system just to churn these people out,” Mr. Rigg said. WASHINGTON (Map, News) - High participation rates on standardized tests in Montgomery and Prince George’s County earn the school districts a passing grade under No Child Left Behind, but hide the fact that at the margins, almost all of the students who don’t take the test are poor and labeled with special needs. In Montgomery, where low-income students made up 26 percent of the district’s 2007 test-takers, they made up 43 percent, or 68 students, who didn’t take the reading test and 39 percent, or 78 students, who didn’t take the math test. Participation rates for the current testing season are due out later this summer. In Prince George’s County, the actual numbers were higher — 189 low-income students didn’t take the reading test and 227 didn’t take math, but the percentages held true to the about 50 percent of low-income test takers in the county. Students with special needs fared no better. While they made up 12 percent of total test takers in both districts, they made up 23 percent, or 45 math non-participants in Montgomery County, and 26 percent, or 116 non-test takers in Prince George’s. Overall, both districts had nearly all of their students take the tests, but in an era where test scores can determine a school’s fate, some worry the lowest performers are subtly encouraged not to show up on test day. MacDonald’s research in Florida and Texas schools found that in addition to those kids who didn’t take the test, many low-performing students were “hidden” by loopholes in the law, rendering the number of actual nonparticipants even higher. Montgomery County school officials take issue with the idea that any student is marginalized and explain the numbers as unable to be helped due to issues like surgery, uncooperative parents and homelessness. The old axiom about evil thriving when good people do nothing has a political corollary in the law of unintended consequences. Single-purpose, shortsighted political decisions made by voters and/or their elected officeholders often interact with each other to create negative impacts that no one really intended. One of California's more egregious examples has been the erosion of job-oriented high school teaching, what used to be called "vocational education" but more recently has been updated to "career technical education" or CTE. Educators' professional bias toward college, parents' natural desires for their offspring to have white-collar careers, fears among minorities about discriminatory "tracking," and the political mania for academic testing combined to create a negative atmosphere for continuing to teach high schoolers auto repair, carpentry, metalworking and other skilled crafts. The state's high school dropout rate soared even as employers began experiencing acute shortages of skilled workers. The good news is that after years of neglect, CTE has become trendy, thanks in large measure to having a champion in Gov. Arnold Schwarzenegger, who had high school job training in Austria. The state even had a brand new set of CTE curriculum standards. The bad news is that a bitter, three-sided political war has erupted over what path renewal should take, threatening to stall progress on an issue that's vital to the state's economy and to countless thousands of at-risk students who might remain in school if given educations that match their interests and aptitudes. Sensing, it would seem, that popular support for technical education is growing, the education establishment has created a glossy, foundation-supported "Coalition for Multiple Pathways" to push the superficially appealing notion that CTE can be combined with academics to qualify graduates for both jobs and admission to four-year colleges. Jack O'Connell, the superintendent of public instruction and the embodiment of the establishment, kicked off the coalition's official launch last week by declaring that it embraces "a new philosophy" of instruction that eliminates the divide between vocational and college-prep curricula. "The two are not mutually exclusive," he said. The coalition is pushing its concept on a broad front, including legislation, and that alarms the advocates of traditional vocational classes, who contend that "Multiple Pathways" will bypass students who aren't interested in and/or capable of college-prep academics. As Multiple Pathways was being launched, the California Industrial and Technology Education Association issued a bulletin denouncing the pending legislation as "scary stuff" and worrying that if it's passed, O'Connell would complete the destruction of traditional vocational classes by redirecting money to the establishment's new framework. The group says that Assembly Speaker Karen Bass' Assembly Bill 2648 would "turn CTE into delivery models that can focus on college prep at the expense of CTE programs that really prepare students for careers they can enter after high school." A third technical education advocacy group called "Get Real," created by business and labor groups, is caught in the middle of the crossfire. Its co-chair, Jack Stewart, says there's nothing wrong with Multiple Pathways for many students but it's "too narrow" to deal with the entire problem. "We don't think Multiple Pathways is the right way to go," says Stewart, president of the California Manufacturers and Technology Association. Stewart and Get Real make a valid point that Multiple Pathways could love vocational education to death. It's an issue Schwarzenegger is in a unique position to resolve, and he should do it as a legacy for his otherwise so-so governorship. at least figure out in what language we do our thinking. we read, scientists working with Italy's National Research Council say. suspects to determine their origin, she said. the European Union and translating in English and Italian. activity" when they switched from one language to another. when they spotted a specific symbol, Proverbio said. recognizes letters as part of words before their meaning is interpreted. the language the interpreters had learned before age 5. University of Kansas who was not involved in the study. "Our mother tongue is the language we use to think, dream and feel emotion,"
that person learned the same word in another language later in life. extra language before age 5.
process when the brain hasn't yet interpreted the meaning of the words. "I didn't expect such differences at the very beginning of the process,"
Dien said in a telephone interview. a lot more work to work out the implications of that." to areas of the brain used to understand the meaning of words. an hour before the board was to take a final vote. curriculum standards for two and a half years. Education Agency) staff was involved or had seen it." by a working group of teachers appointed by the board. "It's really hard to say since nobody has seen it,"
to say for sure what's in there." But the squabbling did not end there. continue at the fast pace. moments after the discussion started. long-simmering dysfunction on the board. informed debate and expert opinion. Conservatives lauded the new curriculum. emphasize grammar and writing skills." (curriculum) review coming up," Canaday said. No matter how bad the day has been, just a little "thank you" from one of my students is all it takes to erase the "yuck" of the day. While higher pay would be nice, public respect and employee benefits would be better. Respect is what I need to keep me coming back. The Legislature shows a lack of respect for teachers as a whole with the incentive pay program. Teachers will always be underpaid, but being underappreciated is much more detrimental. I am blessed to work on a wonderful campus where we are a family of teachers who respect and collaborate. I would love more money because most teachers are worth it, but dangling the carrot of extra money for test scores is demeaning. Teachers want to be treated like the professionals they are. This not only means to be paid well, but also to be given a voice in the processes that affect them. Teachers are not lazy. Grading papers, writing lesson plans, keeping up with current methodologies and their certifications require preparations that extend well beyond their normal workday. Many work close to 60- to 80-hour weeks, uncompensated! Teachers are only paid for the 188 days that they are assigned to teach. This payment is usually stretched out over 12 months, but, despite appearances, teachers are not getting paid to do nothing. If anything, there is no other profession that requires its professionals to do so much for free. I completely concur with Diane Berry about the loss of respect given to the profession of teaching, and I point to administrations and school boards of Texas for not creating career paths for teachers the way they have for administrators. Teachers are the single most important element in a student's success in school, yet we are forever treated like the low man on the educational totem pole. Encourage us to get more education, help us pay for it, pay us according to our abilities and our students' successes, then respect our abilities and let us help those teachers who aren't as competent yet. • I want to be paid for the actual hours that I work. It is normal for fine arts teachers and coaches to work 14- to 16-hour days. There are even core teachers who give extra time to help with academics. The stipends that we get are just a drop in the bucket to the actual hours we put in. • Treat me like a parent to more than 1,000 kids. Those are the numbers of children for whom I have had to buy shoes, shirts, baseball equipment, musical instruments, paper, pencils, bus passes and food. I want to be able to claim some of these children on my tax return. Some of them spend more time with me than they do with their own parents. I may not be performing open-heart surgery or creating new laws, but I am educating people who might do those things someday. I'm not a teacher because I'm not capable of doing something else, but because I chose to teach. It's hard work, it's frustrating, it's heart-breaking, it's extremely rewarding, but it's not for everyone. So please treat me like a professional. I continue to maintain that teachers do 12 months worth of work in nine months. By May, we're exhausted. My summer begins by getting rested. Then I sign up for classes targeted at teacher improvement. I spend countless hours planning ways to present my curriculum in an improved way the following year. I resent those who think we teach just so we can have a three-month holiday. I'm not here for the pay. I left a high-paying job to teach, and it was the best thing I have ever done. However, right now the Texas Education Agency is rewriting the ELA TEKS (English/Language Arts state standards) and making a mess of it. They have not taken the teachers' viewpoints into consideration at all. Why is a bureaucrat telling me what to teach? The state needs to have respect for our professionalism and allow us to have a say in what is important to teach our students. Society gets a flunking grade in "No Child . . . "
A barrage of metal detectors and armed guards greet students on the way to class at the fictional Malcolm X High School in the Bronx. The distinct resemblance between entering an inner-city school and getting into a maximum-security prison was not lost on Nilaja Sun. "God bless teachers. I could never do it," says the actress-playwright, her voice a little raggedy from running through the 17 characters in her breakthrough hit play. "I really wanted to shine a light on that feeling of being in prison, of kids going from one institution to another." Sun draws on her time as a "teaching artist" in New York City public schools where she saw the harsh reality of the fallout from No Child Left Behind, the 2001 federal law that holds public schools accountable for improving student test scores. She uses those experiences in her critically hailed 70-minute solo show, which runs through June 8 at Berkeley Rep.
" 'No Child . . . ' strikes me as a particularly important piece of theater because it offers a window into a world that is terribly important to so many of us, but which we are unable to experience (again) ourselves," says Susie Medak, managing director of Berkeley Rep. "Nilaja allows the audience to eavesdrop on our public schools." Here we witness the trials and tribulations of a generation of students imprisoned by expectations as low as budgets. Simply clad in a white shirt and dark pants, Sun plays all the parts in this hardscrabble inner-city universe, the anti-"Disney High School Musical," as it were, from janitors to teachers to parents and students. "I really wanted to break down what's going on with the politics of public education, but I realized that many audience members have never been in (today's) public schools, and they are scared of inner-city kids. So they won't be able to absorb statistics and dogma," she says. "My goal here was to try to open up people's hearts, so that when they hear about the No Child Left Behind law, they don't just hear words in their brain; they have emotion in their hearts." The Obie-winning Sun projects her gallery of characters from within. Hopscotching through personas without benefit of elaborate costumes and props, she has emerged on the national scene as a quick-change artist whose technical mastery impresses even other solo artists. "She is an amazing performer, jaw-droppingly fast and precise at the same time," says Dan Hoyle, who just won the Glickman Award for "Tings Dey Happen," which recently ran off-Broadway. "And she does it all without costumes, just our collective imagination, which is the essence of the magic of theater." Beyond her fierce facility with the craft, it's Sun's blend of personal and political and her use of the solo form to speak to the state of society at large that most impresses Medak. "Nilaja is much more than a solo performer. She is an insightful observer of social conditions, in the tradition of Anna Deavere Smith," Medak says. "She's created a piece that stands on its own as art but that also has the value of being powerful social commentary." Sun also has scored straight A's with critics. The New Yorker called the show "an object lesson in what should not be missing from any life curriculum: hope." The Los Angeles Times raved that "what may sound like a predictable journey from hard knocks to triumph shifts into something electric through Sun's stunning, disciplined performance." The playwright-actress weaves together strains of experiences from almost 50 public schools, where she staged productions of everything from "Antigone" to "Raisin in the Sun." Though originally commissioned by New York's Epic Theater, a company with a sharp political aesthetic, "No Child . . . " pops with warmth and wit as much as satire and analysis. "If you bash people over the head, they will just turn the page," Sun notes. "I wanted to let everyone know that, even though these kids are in tremendous circumstances in our inner cities, and I'm not saying they love their circumstances, but there's a lot of joy there, a lot of joking around. And I don't think a lot of people know that. "I wanted to shine a light on the real humor the kids have," she says. "Humor is so important in the journey of hope." Snap and strut are hallmarks of a classroom where smart-mouths rule and weakness is not an option. Indeed, in "No Child . . . " - when the teacher tells her class she wants to make them all thespians - semantic potshots abound. When she tells them she wants to stage Timberlake Wertenbaker's "Our Country's Good," a play about convicts in an Australian penal colony, one young fellow enthuses: "Yo, Justin Timberlake done wrote himself a play!" Sun, who comes from a family of teachers, admits she would love to change the state of the public schools, but failing that she'll settle for giving teachers a voice in the public discourse. "A lot of people may have given up hope, but the teachers never have and they never will." She sees the play as a political act but not necessarily in the sense of lobbying lawmakers and pushing for reforms. Rather, Sun hopes to sing the praises of the unsung heroes. She hopes the show gives teachers a sense that their daily battles have not gone unnoticed. "I don't know if I can change the politicians, but I know that tens of thousands of teachers have seen the show, and they go back to their kids just a little bit changed, a little bit lighter," Sun says. "They are able to breathe a little bit, to just get a little bit more oxygen. That's the revolution for me." As Wertenbaker put it, this is theater as an expression of civilization. In the process of putting on the play, the class delves into its sense of identity, from the coarseness of hip-hop culture to the politics of language. "The N-word - that's No. 1 with me," says Sun. "I have to tell them I don't want to hear it. Then we have to have the whole N-word conversation. And sometimes they don't get it, but there's no way you can be open if you are afraid of being called a name, of being taunted." Fans of the play say "No Child . . . " speaks to the power of the arts to reach out to students languishing in a school system in crisis. "Here in California, it has been 30 years since many of our public schools programmed arts as a regular part of the curriculum," Medak says. "So it is refreshing to be reminded, in 'No Child . . . ' of some of the values of teaching the arts: learning the capacity to imagine, the capacity for empathy, the pleasure of being recognized for accomplishment, the value of personal risk-taking for the purpose of achieving new skills." Yet for all its heartwarming motifs, there are no happy endings here. Crime may well be one of the few booming industries for young people without footholds for scaling the cliffs of a shaky economy. Shortly after Sun completed one of her school theater projects, a star pupil was arrested for petty theft and sent to Rikers Island jail. "He was the prince of the classroom; he was very much like the character of Jerome in the play. It was so disappointing. It was crazy," she says. "Of course, a lot of my students have gone on to good things. My hope is that they become good people, good citizens." Introspection darkens her thoughts as she comes to the end of her journey with "No Child . . . " after two years of performing it almost non-stop. "Oh boy. Don't get me started. I'm trying not to get emotional," says Sun. "Berkeley is going to be the last stop, the last city of the run." Letting go of "No Child . . . ," which has been the center of her life for so long, also means passing the torch to other actresses. Where: Thrust Stage, Berkeley Repertory Theatre, 2025 Addison St. If chronically low performing East Austin school fails to meet academic standards this year, state could close it or put it under alternative management. The Austin school district is hoping to create a new vision for Johnston High School that will allow the district to retain some control of the academic programs and follow state education officials' requirements for dealing with chronically low-performing schools that fail to improve. However, it is unclear whether trustees can agree on a new vision for the East Austin school and whether such a plan would be acceptable to state Education Commissioner Robert Scott and allowable under state law. Under the state's accountability system for schools, Johnston could be closed if it again fails to meet testing and attendance standards. But with the help of state Sen. Kirk Watson, D-Austin , school district officials have sketched out a rough plan, without specifics, to create an unconventional instructional program at Johnston that could be modeled after the technology program at Akins High School or the alternative self-paced program at Garza High School. District administrators plan to come up with a more specific plan in the next few weeks after having Johnston parents visit such programs. Whether the entire school board and the Johnston community will back the administration's new vision plan is uncertain, however. Some say the timing is too short. Scott is expected to make a decision about the future of the school by mid-June, after seeing the results of the Texas Assessment of Knowledge and Skills exam. Others question whether the district's plan will be different enough from, or more effective than, what has already been tried. Two years ago, Johnston underwent a state-approved redesign of its academic programs that divided the campus into small learning academies that allowed students to choose electives that focus on science, such as engineering, and the arts, such as filmmaking. Since then, the school has made another shift, to the First Things First program, which focuses on establishing stronger relationships among students and their families and school staff members. Despite those programs, state figures show that fewer than one of every five of Johnston's 711 students passed all portions of the TAKS in 2007. Furthermore, state law appears to leave Scott with little leeway. The Texas Administrative Code outlines the rules for how the state should deal with campuses that have been deemed "unacceptable" under the Texas accountability system, which considers achievement test scores and dropout rates. 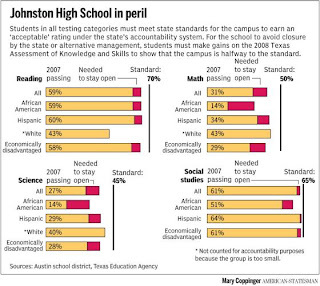 Johnston has failed to meet the acceptable standard for the past four years. If the students fail again this year, Scott must either close the school or put it under alternative management. "While I can appreciate the community's concerns about the future of Johnston High School, as commissioner of education, I am bound by the law," Scott said. "I will continue to work with Sen. Watson, the district and the community to provide a quality education for these students." Johnston would be among the first schools in the state — others include campuses in the Houston, North Forest and Waco districts — subject to the most extreme censure possible under the state's accountability system. If closed, Johnston could be reopened with the commissioner's approval. However, it would be required to have a new name and principal and a mostly new teaching staff, and it would have to either serve entirely new grade levels or not serve more than 50 percent of the same students. Under alternative management, another school district or a nonprofit organization such as a charter school would take over instructional programs. The law stipulates that the commissioner can put Johnston under new management only if there is a reasonable expectation that the school will be rated "acceptable" again in three years. Johnston Principal Celina Estrada-Thomas and trustees said they would prefer the school to remain open to children in the neighborhood and under the district's control, and Watson, a former Austin mayor, said he has hope that Scott will consider other options. "In my conversations with the commissioner, I have been impressed with his willingness to listen to concerns that I've had, and that the school district has had, related to the potential closure of Johnston," Watson said. "The law requires certain things. However, we will continue to work with the commissioner to see how within the law we can meet the specific needs of the community and the district." Superintendent Pat Forgione said he was confident as well. "I believe our commissioner and our state agency is looking to partner with us," Forgione said. The trick is coming up with a proposal to present to Scott that parents and trustees support. Roxanne Perez, a Johnston parent, said she isn't convinced that another program is the best answer and questioned the district's commitment to meaningful parent involvement. "I feel like the wheels are already in motion," she said. After parents and administrators visit programs at schools in Austin, Manor and possibly other cities, the district intends to compile community recommendations and collect letters of intent from groups that would help set up such programs to submit to the Texas Education Agency in early June. Trustee Vincent Torres said he has reservations about the lack of thought and time that administrators are putting into the new vision and warned that he would be a tough sell with the clock counting down to June. "Right now, I think the thing you guys are lacking is credibility," he said at a board meeting last week. "I don't want those kids to be another experiment. You think you folks can come up with what you need in three weeks?" District administrators, meanwhile, have not identified exactly which programs they will look at during the site visits and admit that they won't be able to put any new plan in place before the 2009-10 school year. Patti Everitt, the district's director of redesign, said administrators hope to stay in control at Johnston for one more year and plan to continue some of the more successful programs that were started this year at the school, including one to help boost attendance that involved having parents patrol neighborhoods. District officials have noticeably refrained from talking about visiting charter schools or about exploring the alternative management option. Trustee Karen Dulaney Smith said board members don't want to be presumptive about their options but do want to send the message that the district isn't ready to give up. "I do have confidence that there isn't anyone out there that's going to come up with options that are better than what we will explore." 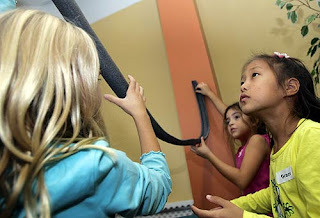 From left, Hanna Sarajian, Gia Alamanza and Grace Pak learn about force and motion by working on a ski ramp made of foam rubber at the Discovery Science Center in Santa Ana. At a time of shrinking school budgets and increased emphasis on standardized testing, field trips are becoming increasingly rare, according to educators and site operators. Visits to art, nature and science exhibits are rare as more hours are devoted to studying for required English, math tests. But some venues are adapting their offerings. Scores of second-graders scrambled through the airy Discovery Science Center in Santa Ana, huddling inside simulators to feel the shaking of an earthquake, building mini-ski jumps to learn about speed and shaping wet sand into riverbanks to observe erosion. The hands-on experiences allowed them to test theories they had only read about in textbooks or heard about from teachers. "A couple of kids have asked me, 'Is this really science?' " said Kathleen Carney, a teacher at Deerfield Elementary School in Irvine. At a time of shrinking budgets and increased emphasis on standardized testing, such class visits to science centers, museums and zoos are becoming increasingly rare, according to educators and site operators. Sixty percent of teachers surveyed across the nation reported decreased funding for field trips in recent years. In California, that could get worse as school districts grapple with Gov. Arnold Schwarzenegger's proposed budget, which would cut about $4.8 billion in education funding this year and next. Field trip coordinators, school principals and teachers attribute the decline in student visitors to increased classroom hours devoted to the high-stakes English and math testing required by the No Child Left Behind Act, as well as budget cuts. "Everything is geared toward that testing," said Linda Kahn, a vice president at the Bowers Museum of Cultural Art in Santa Ana. "And money. Money is a huge issue for each and every school." Between the 2005-06 and the 2006-07 school years, student visits to Bowers' "First Californians" exhibit about mission life dropped nearly 50%, to 880 students, she said. The Natural History Museum of Los Angeles County has seen a sharp decline every year since 2004-05, when 241,075 students visited. Last year, the number dropped to 172,764, which museum officials attribute squarely to increasingly crowded school days and concerns about funding. "It makes me terribly sad," said Carl Selkin, the museum's vice president for education, who grew up in New York City. "I still remember when I was a kid in school how exciting field trips were. I just grew to love museums, the Metropolitan Museum of Art, also the American Museum of Natural History. Those are images I still carry with me." Because it does not charge admission, the National Zoo in Washington does not keep track of student visitors. But teachers routinely tell officials about the obstacles they face in taking trips to the 163-acre zoo. "We've heard from many teachers the same sorts of problems -- it's cost-prohibitive, they have to test to the standards so there's not time for field trips, there are not enough chaperons. We hear that all the time," said Elise Bernardoni, an education specialist with Friends of the National Zoo. "A lot of schools just flat out can't pay $300 for a bus, and frankly, there's nothing we can do about that." Myra Ruedal and two other fifth-grade teachers at Emperor Elementary in San Gabriel received a grant to take their students on field trips last year -- a priority, not a luxury, the teacher said. "Because of the low economic [level] of our students, they don't get to go anywhere," Ruedal said. "We're taking them beyond the borders of Temple City and San Gabriel. They get to see there's life outside of this community." As part of a spending freeze, the Riverside Unified School District in January ordered its schools to reevaluate the necessity of any field trip not funded by donations. Teachers were told to "ask yourself if the expenditure is absolutely necessary for the well-being of kids," said Dianne Pavia, a district spokeswoman. In Moreno Valley, one of Supt. Rowena Lagrosa's first tasks when she took over in 2006 was to scale back field trips. Some were not educational, such as end-of-the-year excursions to amusement parks, she said. Others no longer fit in schools' crammed schedules, she said. The district takes 40% to 60% fewer trips than it once did. The 37,351-student district has been named a "program improvement district," which means it is struggling to meet math and English goals under No Child Left Behind. The standardized testing has already been blamed for decreased arts and music education in some districts across the nation. "Time is our most valuable asset," Lagrosa said. "Our school years are just not long enough, and our school days are just not long enough. We want to ensure that when parents send students to school, it's for instruction." In February, a charter school in Watts canceled a trip to a screening of "The Little Red Truck," a documentary about a touring children's theater, because of the $400 transportation cost. "Buses are incredibly expensive," said Dinah Consuegra, principal of Animo Locke Tech Charter High School. "The funding just wasn't available for us to go." The filmmakers responded by bringing the film to the school. But Consuegra fears that future experiences, as well as arts education, simply will be eliminated because of the governor's proposed budget cuts. "If those kinds of resources get cut from our school, I think our dropout rate will be much higher," she said. Some museums and other institutions are responding by aligning their programs with state and federal standards. After the 1998 opening of the Discovery Science Center, 84,781 students visited on field trips during its first fiscal year. But the numbers began to dip, and within three years it had lost 23,000 field trip visitors annually. So center officials redesigned the exhibits to emphasize their link to California science standards, which dictate what concepts students must be taught at each grade level. The museum also focused on a specific grade level each month. "We upgraded the field trip experience," said Leslie Perovich, vice president of the center. "We use large-scale exhibits to teach science concepts tied into the grade level." It worked. The numbers began climbing, and in the fiscal year that ended in June, 83,949 students visited the center. Kahn said Bowers held a workshop for elementary school teachers in April to show how the museum could tie into their lesson plans and expects to hold more in the fall. Schools that continue to take trips increasingly rely on parental fundraisers and grants. Some turn to city councils for help in paying for buses. To deal with Schwarzenegger's budget, district officials are discussing eliminating the kindergarten and third-grade trips. "It's scary," Brown said. Laura Magana of Anaheim says she is worried that her year-old daughter, Katelyn, will not have the field trip experiences her older children enjoyed. Magana fondly remembers her 15-year-old daughter Briana's fourth-grade trip to Upper Newport Bay, where she learned about the Native Americans who once lived there, native plant life and the birds who forage in the water. "Kids get bored of being taught constantly out of a book," she said. The Target Corp. began offering grants after a 2007 survey of 400 U.S. teachers revealed that nearly two-thirds reported field trips had been reduced in their school budgets. "I was stunned, quite frankly," said Laysha Ward, Target's vice president of community relations. "There's a huge need." The company responded by offering 800 grants of as much as $1,000 each in the last school year. Some 16,000 teachers applied, without advertising. This year, the company doubled the offer to $1.6 million. Last spring, Ruedal at Emperor Elementary used an $850 grant from Target to take about 100 students to the Museum of Tolerance in Los Angeles. It was one of five field trips the teachers took last year. "That one day," Ruedal said, "they learn so much more than what a textbook can show them."